This is Angela Tiatia’s first time in the Archibald Prize though she was a finalist in last year’s Sulman Prize with a self-portrait and is the guest judge of this year’s Sulman. Born in New Zealand in 1973 to a Samoan mother and Australian father, she has lived in Sydney since 2012. ‘When I started this painting, I wanted to portray myself as powerful and confident, but found the process produced the opposite feelings of vulnerability and fragility in anticipation of being looked at and judged. It’s the friction between these two states of power and vulnerability that I am most interested in within my art practice,’ says Tiatia. 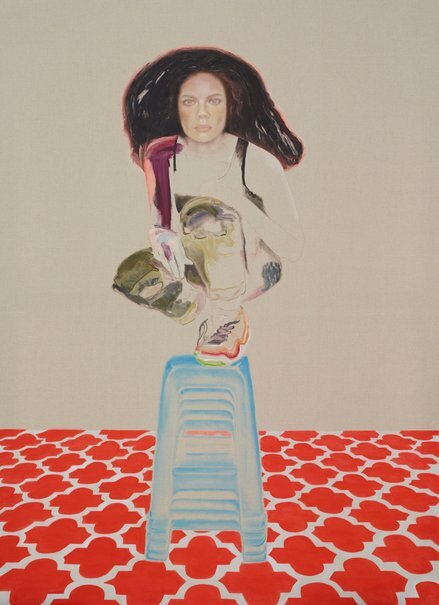 In this work, Tiatia confronts the viewer with her unyielding female gaze in an invitation to return her look. And in doing so, she implicates all of us as she oscillates simultaneously between being the passive object and active subject.